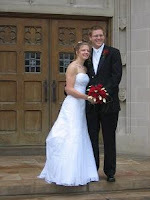 My brother and SIL(Robbie and Jen) were married. Happy 3rd wedding anniversary!! May God bless you with many more years of serving HIM together.